I can´t believe a year has passed since I joined Etsy with a lot of hopes and illusions! And one of the best things was joining the European Street Team, where I´ve been lucky to meet great friends. Although my Etsyversary in not exactly today (the exact date is 21st September), I´d like to celebrate it the whole month, with all of you. So... I´m hosting a new, big GIVEAWAY!!! Who can enter the giveaway? Everyone from everywhere! All of you are invited to participate and win! How can you enter the giveaway? Just leave a comment on this post letting me know the name of your favorite item from my shop, and you will automatically enter the giveaway. It´s that simple! Please, leave an e-mail address to contact the winner. Or if you have a shop at Etsy or Art Fire, just leave the link of your shop here. Note: if for some reason you don´t feel comfortable leaving your e-mail in public, just send me an e-mail with the subject "giveaway" after commenting here. When is the limit date? When will the winner be announced ? WHOHOO am I the first on this one? Oh, Maria, it's hard to choose...I really like the teddy necklace, but also the pink chessboard ring. Congrats on a year of wonderful creations and great fun! My very fave are these http://www.etsy.com/view_listing.php?listing_id=28580850 simple,elegant and purple. Perfect! What a lovely shop! The Blue Briolettes Earrings are so gorgeous! Hope it keeps going well. My favorites are the Leaves Are Falling Earrings and Romantic Hair Pins. Congratulations! You do a beautiful work! I have to tell you that I LOVE all your rings. I wear mine all the time. My next purchase will probably be the pink chessboard or the copper crystal ring. Beautiful! Congratulations on your 'Etsyversary"!! Your creations are ALL beautiful! The Volcano Ring is my very favorite, if I had to choose only one. i love all you creations, so beautiful! my favorite is the lily earrings! And is your photography divine or what?!?! The blue Night bracelet .. it's a beauty! it is difficult to decide ..but I think the Apolo ring! my favourite definitely are the romantic hairpins! (so i would be very lucky to win! My dear Maria, I'm SO happy you joined the EST as that's how we 'met'. I'm easy to please and your Hot Pink Briolettes are simply gorgeous! The Leaves Are Falling Earrings are amazing! Thanks for the chance and Congrats. 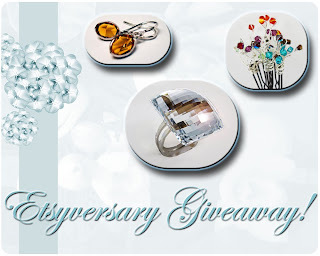 wow great giveaway:D I think my favorite is the Romantic Collection - Tender Topaz :) Love the fall colors. Congrats for your anniversary! My favorite piece of your jewelry is the Sea Star Necklace. Thank you for this chance to participate. Blackhorse and the Sophie rings are beautiful! Congrats on your first year from a fellow Etsian. congrats on your etsy-versary! I think my favourite item would be your "Romantic Collection - Soft Green - Spring Collection" bracelet: I like the simple design and the colour (and sparkle!) of the crystal. My favourite item is the Teddy Necklace! i like the green petal necklace and the new york city ring. amazing pieces! I LOVE the vitrail drop earrings! Gorgeous!! Such a beautiful shop! I have a list of favorites: Snakes Bite Necklace, De Parma Ring, Little Window Ring, Enchanted Forest Bracelet, Vienna Ring, Sparkly Hair Clips, and The Sun In Your Hand Bracelet. Wow! I love them all - how can I choose? I really adore the funkiness of the Pomegranate Earrings! It's hard to pick just one favorite, but that's never a bad thing! 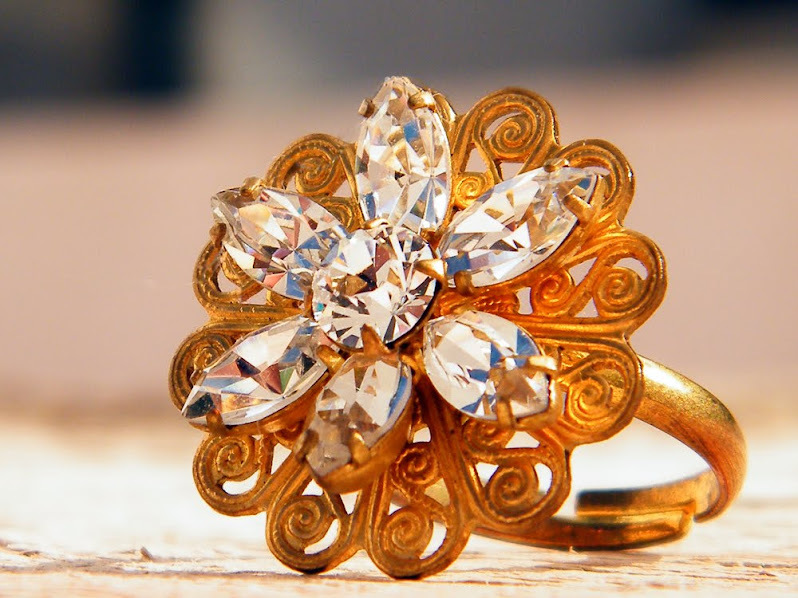 I am a ring junkie and my very favorite is the audrey ring. So beautiful! You have great jewelry, congrats on the anniversary, keep up the great work! Congrats on your Etsyversary! How cool! I love your River Bracelet! Although the chessboard ring is equally gorgeous! I think that the Nature Necklace is absolutely stunning! Congratulations on your Etsyversary!!! You've had quite a lot of sales in your first year; I'm impressed! It's no wonder though, with your lovely creations! I saw that you were from the Canaries - I spent a week in Tenerife while living in Madrid. I got the worst sunburn of my entire life but did have a great time while there!!! There are so many beautiful items in your shop!!! I had a rather hard time picking just one favorite, but I think my absolute most favorite item in your shop is the Romantic Collection - Green Petal Necklace and a close second is the petite dot earrings that you are offering up as part of the giveaway. My favorite is the Starry Sky Ring. Beautiful! This is my favorite! I like all of your items. They're really beautiful.. It's so hard to choose a favorite. I love the "Sweet Teddy Necklace" and "Gloria Ring" the most. I adore the Pomegranate Earrings! I definetly like all the pieces but my favorite is the "Sun in your Hand" bracelet just like I wrote about on my blog because of it's simplicity, beauty and elegance. Congratulations! I like the Blue Briolettes Earrings. My favorites are the Petit Dots Earrings (convenient that they are part of the giveaway, no? ), although I have a small crush on the Evel Earrings as well. I'm definitely in the market for new earrings right now! I find all of your work quite beautiful, but I am especially charmed by the Cherry Bracelet. The colors are so rich and the silver sets everything off beautifully. Congratulations on your upcoming Estyversary! I am glad to find your etsy shop. The gems are simply beautiful. My favorite are the Vitrail Drop Earrings. They took my breath away. Happy Anniversary! I love the Asteroids Ring-very pretty jewelry! I love the Tender Topaz bracelet! love the Rhombus Necklace! thanks for the opportunity! Hello Ms. Maria, congrats on you first etsyversary! I love the City Collection - Vienna Ring. Blue Ocean Necklace - Limited Edition looks so beautiful! The Lyris Necklace from your shop is stunning! Pink is always my fave! i like the athenea necklace! I adore the Rainbow Ring too, cause God sent his promise through a rainbow! I love the Romantic Hair Pins! I love the Romantic Hairpins!!!! I love your Burgundy Pendant- fabulous color!! Shiny things just make my heart go aflutter. I love the Vitrail Drop Earrings. They make me think of the song "Toxic" by Britney Spears. I LOVE the Star Dust Necklace. Oh that is SO pretty! The Spiga Pendant is so lovely! I like the shape and how sparkly it looks. Thanks for entering me into your giveaway and congrats on your etsyversary! I love http://www.etsy.com/view_listing.php?listing_id=29010115. Very artistically crafted. My favorite item is the City Collection - Vienna Ring! All of your pieces are so beautiful but my favorite is the Vitrail Drop Necklace because it has my birthstone color, green, and my favorite color red. I love Exquisite Green Crystal Ring !!! Hello and congratulations! So many pretty things but I love green so.. I think today I'll pick the Vitrail Drop Necklace, though there is certainly a lot that I adore! Congrats on the "Etsyversary". Etsy is such a great site. I really like the Asteriods Ring, very cute and cool. I love the Blue Montana Hearts pendant! Thanks for the giveaway! My all time favorite is, indeed those iceberg rings of yours! Sooo beautiful! And congrats for the etsyversary! It's a great community, isn't it? I like the Enchanted Forest Bracelet. I love the Blue Briolettes Earrings! I love the Hydra Ring - Soft Blue. 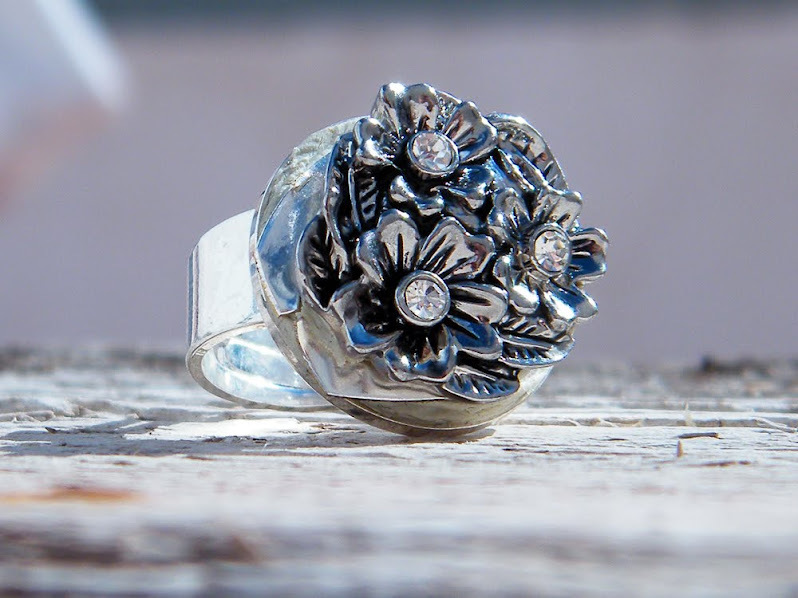 My VERY favorite item in your shop is the City Collection - Vienna Ring. BEAUTIFUL!! You really have made cute pieces. I love the teddy necklace. I love the tied earrings! I so love A Piece of Choco ring. I love The Queen In Green ring. Stunning! Congratulations on your first full year! Your items are amazing! Stunning work! My favorite item has to be the green petal necklace. It is so delicate and romantic. This is the most beautiful jewelry! Absolutely stunning! A couple of my favorites are the Remy Bracelet, Dragonfly Necklace and all of the gorgeous rings. Happy Etsyversary and thank you for the giveaway! Love the The Sun In Your Hand Bracelet. I like the Rainbow Ring. I like the Brown Peas In A Branch Necklace. I really like your Snakes Bite Necklace. Happy Anniversary! Your jewelry is beautiful and I love the green colors in it. I like all the earrings (and believe it or not just recently got my ears pierced!). I'd have to say I like the daisy earrings best though. I really like the Rainbow ring . Beautiful Things~My favorite is the Vitrail Drop Earrings! My favorite is you Insomnia ring! I love, love, love the Valerie earrings! Congrats and thanks! I love the Green Petal Neckalce from the Romantic Collection. . . I like the City Collection - Paris Lariat, it is very elegant. The Cherry Lariat is absolutely stunning and my favorite piece by far. The Ruby Pendant is lovely also. You do wonderful work, and I thank you for the chance at winning your generous giveaway! Oh wow. My name is Alyssa and I love the Eldorado Necklace! I love the Sea Star Necklace, very pretty!! My fave item in your shop are the BLOOMIN earrings! Thanks for the chance to win. Love the Snakes Bite Necklace !! You have a really cool Etsy shop. 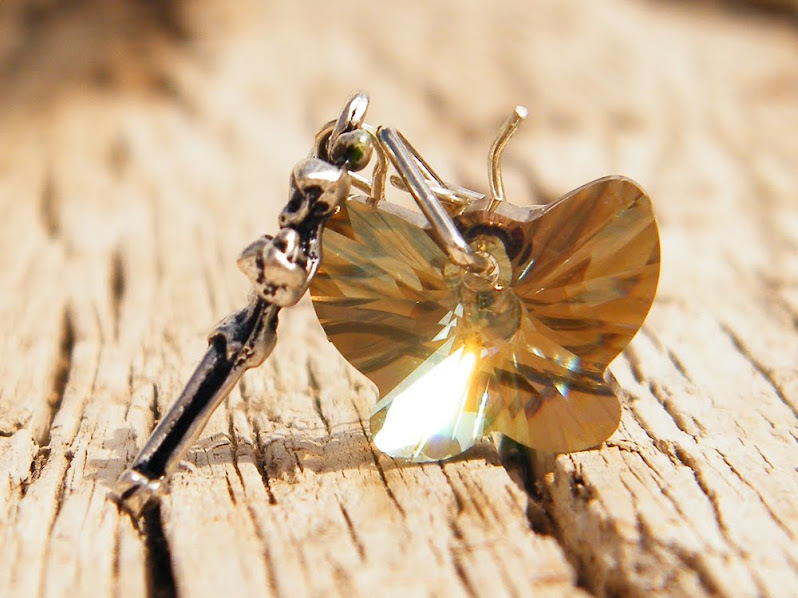 I love Blooming Earrings, they are so beautiful! I like the blue ocean necklace. It's simple and elegant, but bold enough spice up an outfit. Very beautiful items, one of my favorites is the The Sun In Your Hand Bracelet. I love big chunky rings and you have an fabulous section. My favorite is your Delicate White Chessboard Ring. It's such a beautiful color and it coul be worn with practically ANY color wardrobe. It's fabulous! I love big chunky rings and you have a wonderful selection. My favorite is your Delicate White Chessboard. It can be worn with practically any color wardrobe. It's fabulous! There are so many beautiful pieces in your shop! I think my favorite is the Dragonfly Necklace. I just love your store and I in love with the insomnia ring. I love the Pegasus Necklace-unique style and the color of the crystal is gorgeous! Oh, I love your shop!!! Hard to narrow down a choice!! I love the little window ring!! I also love the romatic hair pins! I think the Delicate Balances Necklace is my favorite today! I'm stuck somewhere between the Bellisima Necklace, Romantic Collection - Green Petal Necklace, and Lily Pendant. All three are gorgeous! My favorite are the Hearts of Lavender Earrings :) *Thanks* for the giveaway! Congrats on your Etsy Anniversary!! I especially like the Captive Drop earrings! How unique!! Thanks for the opportunity to enter your give away! I am loving the Green Petal Necklace from the Romantic Collection. I am loving the Green Petal Necklace from the Romantic Collection. How pretty! Actually i simply love hair pins , they are soo romantic and just lovely. Have a great day and i am really impressed by ypur talent! Happy Etsyversary! I really like your jewelry, and adore your rings. Sophie, the Insomnia and the Iceberg rings are my favs. I like Green Apple Bracelet. Love the mix, its really special!! amazing mix, its really special! I love the Delicate Burgundy Earrings~Beautiful!! I love the Delicate Pink Chessboard Ring! My favorite color, my favorite bead, my favorite type of jewelry and my favorite shape! Oops! I forgot to say what it was that was my favorite color, bead, jewelry and shape...Venus Heart - in Purple - Necklace! 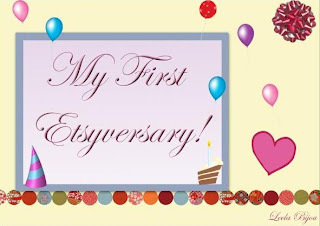 Congratulations on your first Esty anniversary!!! I love the sweet teddy bear necklace and know my daughter would too! I hope this next year will be a great one for you on Etsy! I just love your jewellery! I like the green apple bracelet the best! Your jewellery is beautiful. I adore the Sweet Teddy Necklace. Please enter me. Thanks very much. I like the Cleopatra Necklace. Beautiful jewelry! I love everything! It's so beautiful. Congrats on your anniversary. Introducing Lulu! Our new cat!